You can flash the image with Win32DiskImager (Windows) or dd (linux) to a micro SD card the usual way, and while I’ve never personally had troubles with dd, I’ve been told Etcher was better, as it verifies the SD card after flashing, and dd may miss errors. Etcher works in Windows, Linux, and Mac OS with a graphical user interface or from the command line. 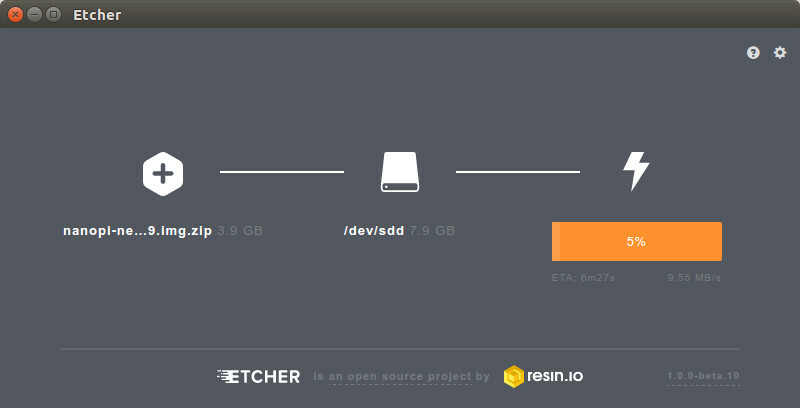 I used Etcher GUI in my Ubuntu 16.04 computer, and it’s indeed easy to use, shows the progress, and a big plus for me is that you can’t mess with your USB hard drive, as it will filter them. Another small advantage is that you don’t need to uncompress the firmware, as Etcher will do that for you, at least for zip files, but i had to manually uncompress Armbian .7z archive before loading to Etcher. Note that I used the exact same micro SD card (the 8GB SanDisk Ultra sold by FriendlyELEC) and the same board for both images. I started with FriendlyELEC image, and then repeated the test with Armbian image. 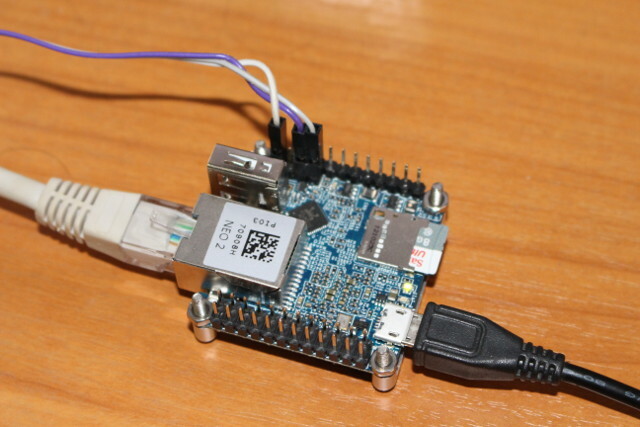 I connected the Gigabit Ethernet port to my GbE switch, as well as FriendlyELEC Matrix USB2UART board with the provide cabled including 5V, GND, Tx and RX. It will power the board too, but if you’re going to run benchmarks, there won’t always be enough, and I also used a USB power supply connected to the micro USB port. Having 5V on the serial cable makes it inconvenient, because when I need to power cycle the board I had to remove both the debug board and the extra USB power supply. So instead I used 3 jumper wires without 5V as shown in the picture below. no report hpd work,you need support the switch class! screen 0 don't support TV! hdcp is closed by sys config. hdmi hpd out, force open? [ 4.536452] SELinux: Disabled at boot. [ 4.578398] virtual base = 0xffffff800000a000. [ 4.578412] gicd_base = 0xffffff800000c000. [ 4.578417] gicc_base = 0xffffff800000e000. [ 4.583922] SMP: Total of 4 processors activated (192.00 BogoMIPS). [ 4.623060] hw-breakpoint: found 6 breakpoint and 4 watchpoint registers. [ 4.721153] pwm module init! [ 4.740847] Advanced Linux Sound Architecture Driver Initialized. [ 4.744742] np name = /soc@01c00000/rtc@01f00000. [ 4.744749] base = ffffff800006c100, len = 4. [ 4.744755] pmu name: pmic0 . [ 4.744840] Warning: can not find np for pmic0. [ 4.744845] pmu name: pmic1 . [ 4.744868] Warning: can not find np for pmic1. [ 4.744966] add_sys_pwr_dm: axpdummy_ldo6 ldo already alwayson. [ 4.744988] add_sys_pwr_dm: vcc-pc not sys id. [ 4.744993] after inited: sys_mask config = 0x4855. [ 4.745016] Warning: can not find np for dynamic_standby_para. [ 4.745159] Notice: sun9i &amp; sun8iw5 &amp; sun50i not need support normal standby. [ 4.763663] sunxi budget cooling probe start ! [ 4.843376] RPC: Registered named UNIX socket transport module. [ 4.843382] RPC: Registered udp transport module. [ 4.843387] RPC: Registered tcp transport module. [ 4.843392] RPC: Registered tcp NFSv4.1 backchannel transport module. [ 5.108609] lock super standby defaultly! [ 5.117153] NTFS driver 2.1.30 [Flags: R/W]. [ 6.569316] ohci0-controller get usb clk_usbohci12m clk failed. [ 6.575782] ohci0-controller get usb clk_hoscx2 clk failed. [ 6.581881] ohci0-controller get usb clk_hosc failed. [ 6.587407] ohci0-controller get usb clk_losc clk failed. [ 6.743010] ohci1-controller get usb clk_usbohci12m clk failed. [ 6.749487] ohci1-controller get usb clk_hoscx2 clk failed. [ 6.755582] ohci1-controller get usb clk_hosc failed. [ 6.761098] ohci1-controller get usb clk_losc clk failed. [ 6.925032] ohci2-controller get usb clk_usbohci12m clk failed. [ 6.931507] ohci2-controller get usb clk_hoscx2 clk failed. [ 6.937593] ohci2-controller get usb clk_hosc failed. [ 6.943119] ohci2-controller get usb clk_losc clk failed. [ 6.977684] ohci3-controller get usb clk_usbohci12m clk failed. [ 6.984161] ohci3-controller get usb clk_hoscx2 clk failed. [ 6.990248] ohci3-controller get usb clk_hosc failed. [ 6.995772] ohci3-controller get usb clk_losc clk failed. [ 7.366646] [cedar]: install start!!! [ 7.376452] [cedar]: install end!!! [ 7.392629] sunxi gpu cooling probe start ! [ 7.507612] sunxi-mmc 1c0f000.sdmmc: Got CD GPIO #166. [ 7.658301] mmc0: host does not support reading read-only switch. assuming w.
[ 7.712634] AUDIO :get regulator name failed . [ 7.788384] Netfilter messages via NETLINK v0.30. [ 7.800729] ctnetlink v0.93: registering with nfnetlink. [ 7.816501] NF_TPROXY: Copyright (c) 2006-2007 BalaBit IT Ltd.
[ 7.967225] there is no tve dac(0) offset value. [ 7.975959] [DISP] disp_init_tv,line:641:screen 0 don't support TV! Superblock last mount time is in the future. [ 9.535340] systemd: Detected architecture arm64. Welcome to Ubuntu core 16.04 LTS! [ 9.559310] systemd: Set hostname to . [ 9.858420] systemd: Listening on udev Kernel Socket. [ 9.884072] systemd: Started Dispatch Password Requests to Console Direct. [ 9.913444] systemd: Started Forward Password Requests to Wall Directory . [ 9.942719] systemd: Listening on udev Control Socket. [ 9.972021] systemd: Reached target Encrypted Volumes. [ OK ] Reached target Encrypted Volumes. [ 10.002288] systemd: Listening on Journal Socket (/dev/log). [ 10.031569] systemd: Listening on Journal Socket. [ 10.051988] systemd: Reached target Paths. [ 10.072395] systemd: Created slice User and Session Slice. [ 10.100148] systemd: Reached target Swap. [ 10.121591] systemd: Listening on /dev/initctl Compatibility Named Pipe. [ OK ] Listening on /dev/initctl Compatibility Named Pipe. [ 10.150525] systemd: Created slice System Slice. [ OK ] Created slice System Slice. [ 10.228309] systemd: Reached target Slices. [ 10.359156] systemd: Starting Create list of required static device nodes. [ 10.395675] systemd: Created slice system-serial\x2dgetty.slice. [ 10.424789] systemd: Reached target Remote File Systems (Pre). [ 10.454371] systemd: Reached target Remote File Systems. [ 10.498611] systemd: Mounted Debug File System. [ OK ] Mounted Debug File System. [ 10.523661] systemd: Started Journal Service. [ OK ] Started Load Kernel Modules. [ OK ] Started Create list of required sta...ce nodes for the current kernel. [ OK ] Started Set console keymap. [ OK ] Mounted Configuration File System. [ OK ] Mounted FUSE Control File System. [ OK ] Found device /dev/ttyS0. [ 11.534840] node ir_addr_code16 get failed! [ OK ] Found device /dev/mmcblk0p1. [ OK ] Listening on Load/Save RF Kill Switch Status /dev/rfkill Watch. [ OK ] Found device /sys/subsystem/net/devices/eth0. [ OK ] Started ifup for eth0. [ OK ] Started Network Time Synchronization. [ OK ] Reached target System Time Synchronized. [ OK ] Started Set console font and keymap. [ OK ] Started Restore /etc/resolv.conf if...fore the ppp link was shut down. [ OK ] Started brcm_patchram_plus. [ OK ] Started LSB: Start busybox udhcpd at boot time. [ OK ] Started LSB: Set the CPU Frequency Scaling governor to "ondemand". [ OK ] Started Raise network interfaces. [ OK ] Started dnsmasq - A lightweight DHCP and caching DNS server. [ OK ] Started Save/Restore Sound Card State. [ OK ] Reached target Host and Network Name Lookups. [ OK ] Reached target Network is Online. [ OK ] Started /etc/rc.local Compatibility. [ OK ] Started Set console scheme. [ OK ] Started LSB: disk temperature monitoring daemon. [ OK ] Started Serial Getty on ttyS0. [ OK ] Started Getty on tty2. [ OK ] Started OpenBSD Secure Shell server. [ OK ] Started LSB: Advanced IEEE 802.11 management daemon. [ OK ] Reached target Graphical Interface. Linux 3.10.65 is used, and the root file system was automatically resized during the first boot to make use of the complete storage available on the micro SD card. We have 928 MB used out of 7.2 GB. It will show four Aarch64 cores part of sun50iw2 family. There are some module loaded specifically for camera support such as vfe_v4l2 module, which you could disable in /etc/modules if you don’t need it. I’ll need GPIO support for BakeBit Starter Kit, and it seems enabled by default. Welcome to Ubuntu 16.04.2 LTS! [ OK ] Listening on Syslog Socket. [ OK ] Listening on fsck to fsckd communication Socket. [ OK ] Set up automount Arbitrary Executab...ats File System Automount Point. [ OK ] Started Restore / save the current clock. [ OK ] Started Nameserver information manager. [ OK ] Mounted /tmp. [ OK ] Started Entropy daemon using the HAVEGE algorithm. [ OK ] Started Armbian enhanced Log2Ram. [ OK ] Started Armbian filesystem resize service. [ OK ] Started Armbian first run tasks. [ OK ] Started System Logging Service. [ OK ] Started LSB: Start/stop sysstat's sadc. [ OK ] Started LSB: Starts LIRC daemon..
[ OK ] Started LSB: Load kernel modules needed to enable cpufreq scaling. [ OK ] Started LSB: set CPUFreq kernel parameters. [ OK ] Started LSB: Set sysfs variables from /etc/sysfs.conf. [ OK ] Started LSB: Armbian gathering hardware information. [FAILED] Failed to start Set console font and keymap. See 'systemctl status console-setup.service' for details. [ OK ] Started Network Manager Wait Online. [ OK ] Started Authenticate and Authorize Users to Run Privileged Tasks.